Drying building materials is a must to eliminate some of the hazards of water damage. However, do not start to dry out materials before assuring structural stabilization. Not all materials can be dried. Depending on the extent of the damage, some materials can be reused and some must be discarded. If you discard any materials, do it properly and remember to keep a piece of every discarded material so the adjuster can determine its value. If given enough time and low enough humidity conditions, concrete will simply dry on its own. You can accelerate the process and remove water using a water extraction vacuum and improve humidity conditions by using dehumidifiers, fans, and heaters. Most plaster walls can be saved if damaged by clean rainwater and treated within 48 hours. 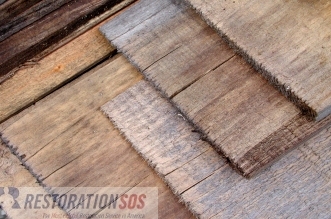 However, if soaked in dirty floodwaters, the wallboard must be replaced. Drill holes through the plaster to allow proper drainage of water that may be held within the wall cavity. Start with removing the baseboard several inches above the floor. Then, drill the holes low enough so they will be covered by the baseboard after the wall dries out. If you are drying interiors walls, drill holes in both sides of the wall. For exterior walls, drill only in the interior side of the wall. The next step is to check insulation. If insulation is wet, it is useless but it will keep holding water and create high humidity conditions in the wall cavity. Remove the plaster or wallboard and discard all insulation. Most wall coverings trap water inside the wall, preventing it from drying out and must be discarded. However, if the water level is low, you can pull the covering from the bottom up to the flood level. Allow thorough dry out and disinfection before reapplying the covering. Drying paneling is similar to drying wallboards; it is done with proper drainage. Carefully open the bottom of each panel away from the wall and use clean objects to keep the bottom away from the ground to allow the cavities to drain and dry out. After confirming a complete dry, nail the paneling back. Pay attention to the insulation. If it is wet, remove the paneling and take out all the insulation. The basic rule of floor drying is air circulation. Best air drying results are reached using proper dry out techniques. Floor covering must be removed to allow air to directly contact the floor and collect humidity. If you have a crawlspace, remove any plastic sheets, vapor barriers, or insulation from underneath the floor. Reapply only after the floor and foundations are completely dry.